Is Doctor Who too scary? Should it carry a warning for parents of young children? PEOPLE of my generation spent Saturday evening hiding behind the sofa, gingerly allowing half an eye to return to the screen and then ducking back as another image scared the living daylights out of us. It was all part of the fun of watching Doctor Who, and I don't think it did us any harm. It certainly got the adrenalin going. It also taught us about our emotional capabilities and pushed the limits of what our imaginations could tolerate and understand. It taught us that television drama is fiction and that the images are of actors playing — something that I sometimes think both children and adults have nowadays forgotten. THIS namby-pamby society of wall-to-wall guidelines and political correctness has gone too far. If parents really cannot decide whether a programme is too scary for their child, then are they really fit to be parents? Why don't these people try doing something as radical as using the television's off-switch at the first sign of something frightening? If the BBC stopped responding to every minor hysterical complaint, it might have time to make some more decent programmes. fright being a good thing and that the second Doctor Who programme was simply an enjoyable scare for all (The Times, April 15). Collins assumes that all children react in the same way. They do not Countless small children would have found the ghoulish nature of the programme very frightening indeed. Dead bodies, ghosts and coffins are not readily enjoyed before the age of understanding. The horrors of the programme, including the immolation of a servant girl, were not even ameliorated by a good dose of fun. Tbis was entirely lacking. THOSE of us who have been fans during the past four decades have long considered that Doctor Who is overdue for receiving formal recognition as a great British institution. The decision by the Conservative Shadow Cabinet to adopt an official position on the programme must surely constitute a near-final stage. It possibly also tells us something about the Conservative Party that, in the middle of an election campaign about the economy, health, education and law and order, they can still find time to discuss Doctor Who. The Timelords must be shaking their heads in disbelief. I SAW the zombie episode and thought that if I had been a child I would have been absolutely petrified by the I saw — although my own three children (13, 12 and 8) seemed not to mind. 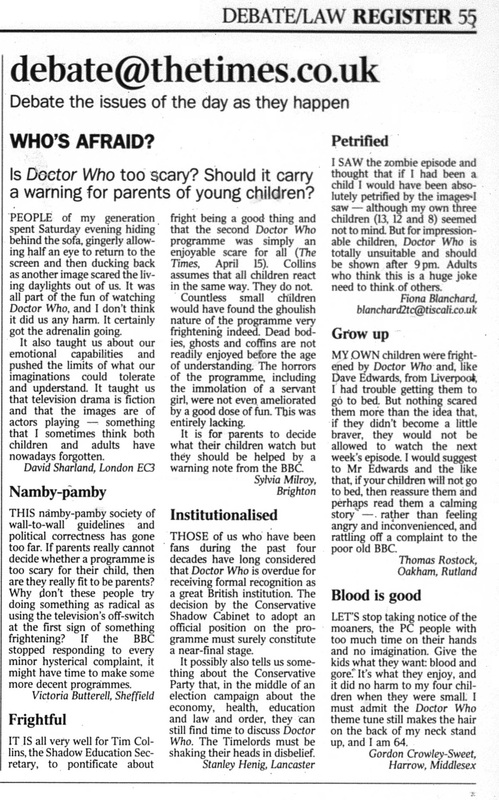 But for impressionable children, Doctor Who is totally unsuitable and should be shown after 9 pm. Adults who think this is a huge joke need to think of others. MY OWN children were frightened by Doctor Who and, like Dave Edwards, from Liverpool, I had trouble getting them to go to bed. But nothing scared them more than the idea that, if they didn't become a little braver, they would not be allowed to watch the next week's episode. I would suggest to Mr Edwards and the like that, if your children will not go to bed, then reassure them and perhaps read them a calming story — rather than feeling angry and inconvenienced, and rattling off a complaint to the poor old BBC. LET'S stop taking notice of the moaners, the PC people with too much time on their hands and no imagination. Give the kids what they want blood and gore It's what they enjoy, and it did no harm to my four children when they were small. I must admit the Doctor Who theme tune still makes the hair on the back of my neck stand up, and I am 64. APA 6th ed. : (2005-04-19). Who's Afraid?. The Times p. 55. MLA 7th ed. : "Who's Afraid?." The Times [add city] 2005-04-19, 55. Print. Turabian: "Who's Afraid?." The Times, 2005-04-19, section, 55 edition.